House on 15th [Fifteenth] St.
Where was this house located? 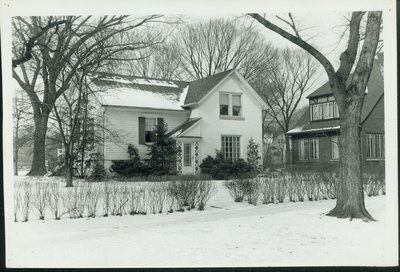 In pencil on reverse, "1950, made of two cabins, very old" In pen on reverse, "House on 15th St. (Mrs. Caruthers House). Stamped "Photo by Bill Kuiken, 1337 Washington, Wilmette, Ill."